Radars on board are probably the most used equipment during navigation. It is a good tool for the look out. We are so much dependent on the Radar that sometimes we use it more than we use our eyes for look out. But what if I say that radar is also most under utilized equipment on board. Don’t believe me, then try answering this questions in yes or no. Most of the times I do not use any controls other than gain, sea and rain. Did you say Yes or No ? Whatever your answer, but most of the people use only these three controls for setting up a radar. And that is undeniable fact. This is even when Radars have so much more than these three controls. And when we do not use all the controls to set the picture, the picture might look cluttered. Through this post, I want to discuss how best we can have radars paint a perfect picture of all the targets. 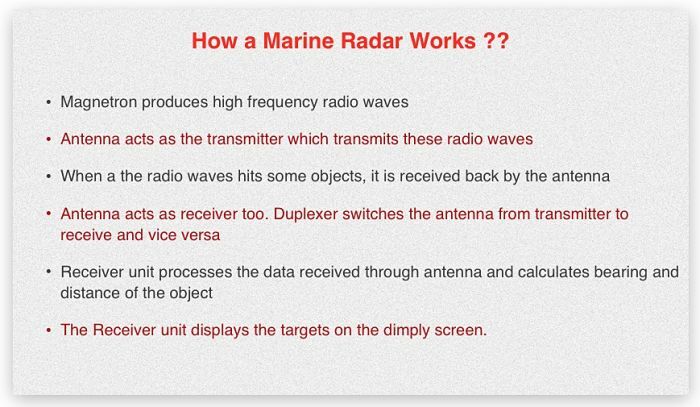 Before we start into the controls of the radar, it is important that we know how marine radars operate and some of the terms associated with the operation of radar. A radio wave is transmitted and received back by the scanner. The time is calculated between transmission and receiving back this wave. The speed of the radio wave is known and thus the receiver unit calculates the distance of the target. After processing, it displays this information on the display screen. The rotating scanner also calculates the bearing of the target and displays on the radar screen. There are couple of terms related to radar that we need to cover before we proceed further. These are radar resolution and radar sensitivity. As the name suggests, better bearing resolution means radar can paint two near targets on same bearing as separate ones. Bearing resolution depends upon Horizontal beam width of the radio wave. 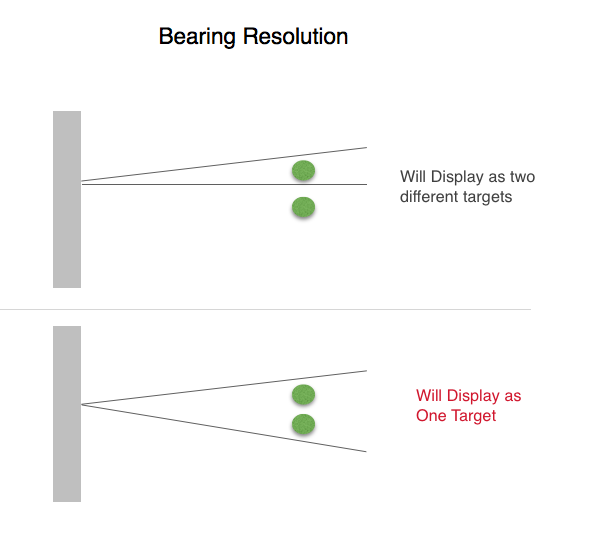 Same way, better range resolution means radar can paint two close targets (on different bearing) as separate ones. Range resolution depends upon pulse length. In simple words, Sensitivity of radar is how thick a radar plots the targets. A better sensitivity means a radar can paint even a fishing boat as slightly bigger target. 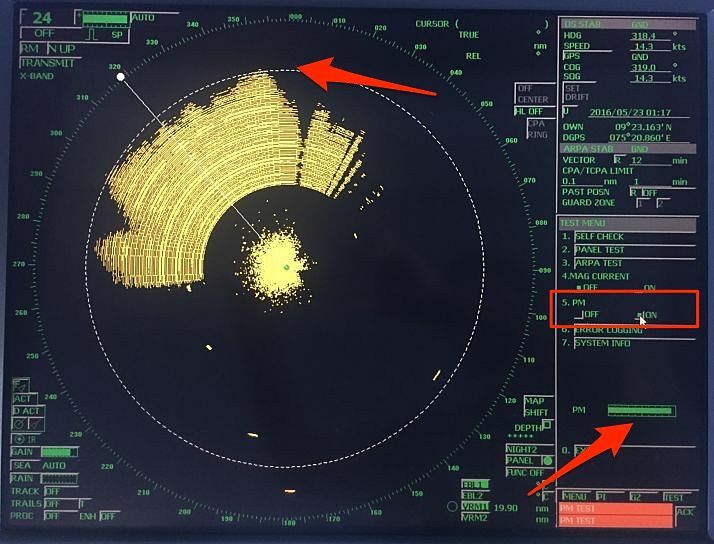 Less sensitivity means there are chances of a fishing boat missing on the radar screen. Now that we know these terms, lets see how best we can set a radar to display the targets perfectly. This is the easiest one I guess. Easiest because we use it lot of times. And I do not need to elaborate much on these controls. But still for the benefit of few, lets say few word about these controls. Gain is used to increase the receiving sensitivity of the radar. It need to be adjusted to a level where targets are visible but there is no other interference on the screen. And we use Rain control to reduce the clutter echo caused by rain. Let me ask a question. To what level we need to keep these three controls ? For example, Will the Full “Gain” and half “Sea” control levels paint targets with same clarity as Half “Gain” and zero “Sea” control level ? We must use Sea control only when we have moderate to rough sea or when we think that interference on the radar is because of sea state. Otherwise we should not use the sea control. In the calm sea if we see clutters, it is better to reduce the gain than increase the Sea control. Moreover we should not try to remove the interference at long range with Sea control. This is because the interference from the sea will be at close range only. 3) Reduce the gain to a level where most of the clutters are just removed and the targets can be distinguished. 4) If required increase the sea control to reduce the sea clutters near to the center of screen. Pulse length can be set to Short, medium or Long pulse. Most radars automatically adjust the pulse length according to the selected range. But knowledge of pulse length can help in setting the radar in way to show the targets clearly. now lets see what each pulse length does..
Short pulse: As we saw in range resolution, short pulse offers better range resolution. But as the pulse length is short, sensitivity of the short pulse is lesser compared to long pulse. 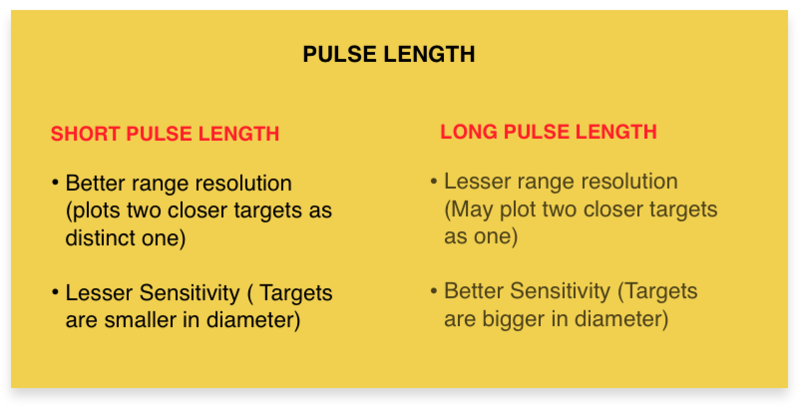 Long pulse: Again as we saw in range resolution, long pulse has lesser range resolution but better sensitivity. Medium pulse off course lies between short pulse and long pulse. We can conclude that short pulse paints two close targets as separate targets. Also the plotted targets are thinner in diameter. The long pulse may paint two close targets as a single one. Also the plotted targets are bigger in diameter. So how we can use this information ? Ideally short pulse is used in short range (Upto 3NM) and long pulse for long ranges (more than 12NM). But we can use the short pulse in long range and vice-versa. For example in dense traffic area, if we are using radar on long range, we can use the short pulse so that targets do not overlap. Same way, in fishing traffic, we can use the long pulse at short range. This will ensure that fishing targets are plotted as more prominently. Gain, Sea and rain as well as pulse length is common settings on all the radars. Apart from these there are number of other settings specific to radar make. These setting help to get a perfect picture on radar. Lets see few of these on JRC radar. We need to set the function level according to the range in use and weather. Function 1 need to be set on short ranges. Function 2 need to be set on long ranges. And Function 3 need to be set during bad weather. During bad weather we can use Func 3 along with SEA control. If using both, we need to use the sea control after setting the function level to “Fucn 3″. To change the Function setting, just click on the Func tab on bottom right corner of the radar. On JRC Radars, this function is called Expand targets. As the name suggests, it expands the size of the targets and targets paints with better echo. We should only switch off the ENH function when there are too many target in close range to each other. In dense traffic area with ENH on, the targets can overlap and if that is the case, it can be switched off. In open sea ENH should be On. Again to switch on/off ENH, just click on the ENH on/off tab on left bottom corner of the JRC radar. On JRC radars we have an option to select processed videos. There are number of option from Proc 1 to proc 3 and then for switching off the Processed video settings. This function defines the speed of processing and displaying a target on radar screen. 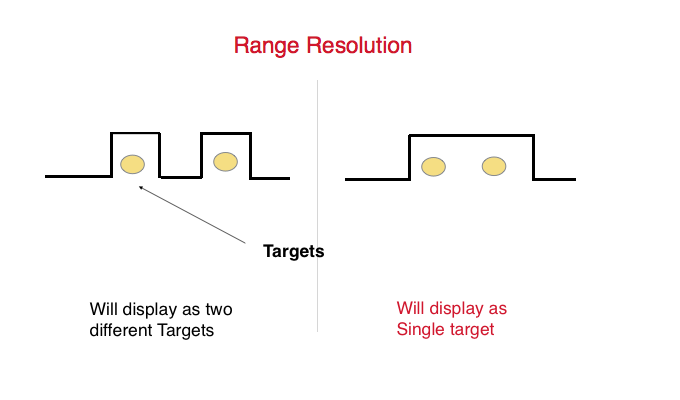 When lesser range is set on the radar, the targets moves faster on the screen. So the radar processor has lesser time to process the fast moving targets. This setting adjusts the speed of the processor so that faster moving targets can be painted accurately and promptly. PROC 1 setting processes the targets faster than PROC 2 and PROC 3 settings. With PROC 1 setting, the faster moving targets are not missed on the screen. As the targets moves faster on the radar screen at lower range, PROC 1 is used in range of 1.5 NM or lesser. Similarly PROC 2 is used for range of 1.5NM and 3NM. We should use PROC 3 when radar is set on range of 3NM or higher. To set the processed video level, just click on the PROC tab on left bottom corner of the JRC radar. If set correctly, this can reduce the unwanted clutters from the radar to some extent. This control reduces the interference caused because of radar signals itself. This is internal interference of the radar and not because of any external factors. This interference is mainly centered near to the ship location on the radar. Turning IR control on reduces these internal radar interference. IR can be turned on/off by clicking on the IR tab on the left bottom corner of the JRC radar. If even after all these settings, you think that there are some targets you are missing. Or the radar is not able to paint the target with sufficient sensitivity. You can perform some of the tests to check if everything is alright with you radar. We need to perform Radar performance test at least every watch. But most of the times navigators fail to perform this test every watch. Sometimes it is not done for weeks and they make the entry in the log book without doing the test. Radar Performance test checks the transmission and receiving power of the radar. For example if the transmission power of the radar is not enough, radar may not be able to paint some of the target at all. Or radar may only be able to paint the targets with very less sensitivity (faint echoes). On JRC radar, to perform the performance test, go to Test menu..Choose PM on. This will change the radar range to 24. Increase the gain to full and you can see plume on the radar. Also you can see the bar on the bottom right corner of the radar. Measure the maximum range of the plume on the screen and check the bar length. On JRC radars, plume range represents the receiving power and bar length represents the transmission power. These values need to be compared with the actual reference values when the magnetron was new. You can find these values on the sticker usually pasted behind the radar equipment. But it is possible that you either do not find this sticker or you may find the sticker without any values on it. This is particularly the case when last magnetron was change by ship staff as shore engineer would definately put the values. If you do not find the initial values, take the maximum values which has the loss of power as zero in the graph. We need to compare these values with the initial one on the graph provided in the manual. 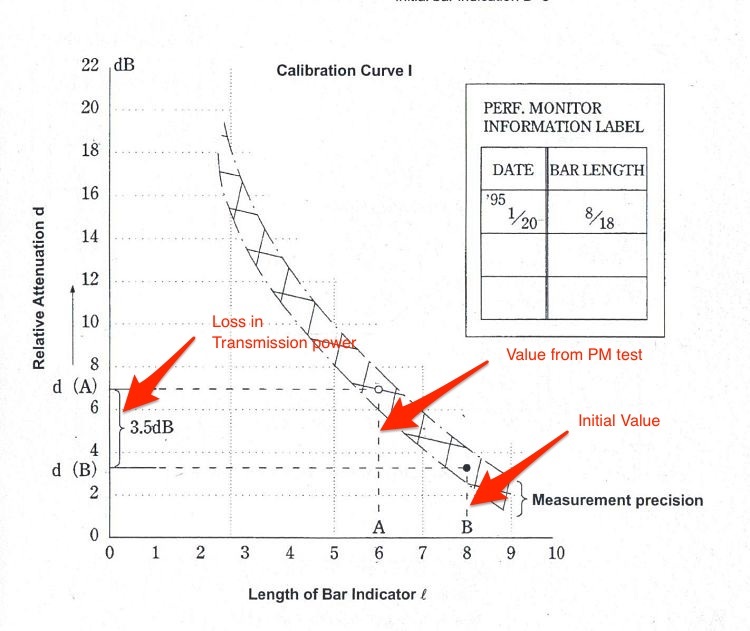 These graphs (Called calibration curves) are different for receiver and transmitter power. By comparing the actual plume length with the initial plume length, we will get the loss in receiver system. This loss is called sensitivity deterioration. Similarly by comapring the actual bar length with the initial bar length we will get the loss in transmission power. This loss is called relative attenuation of the transmitter system. If the transmission power is less, the radar may not paint targets at longer range. If receiver sensitivity is less, radar may paint the targets with weak echo on the screen. In case of less receiver sensitivity, we may use the Long pulse and ENH in all ranges to increase the sensitivity till the time service technician attends to the radar. 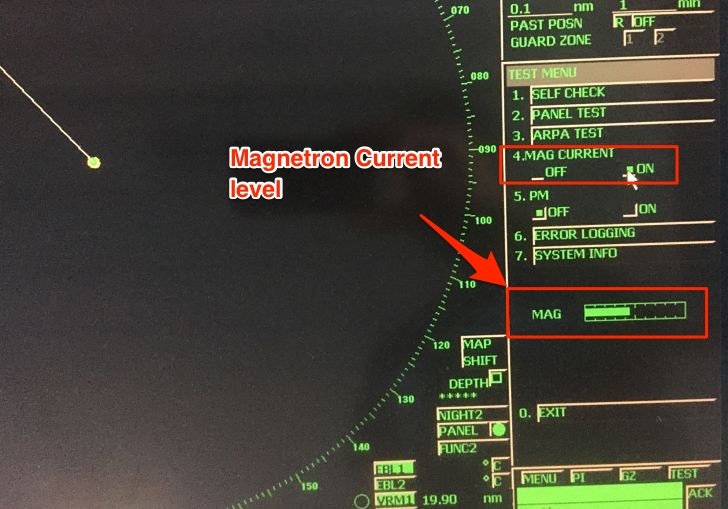 If the ship staff is changing the magnetron by themselves, they may find no change in performance of radar after changing the radar. This is because after the magnetron is changed, it need to be tuned. 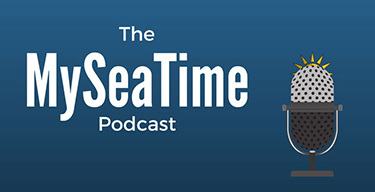 Ship staff need to have the tuning procedures from the maker or need to call service technician. Even when the result of performance monitor test is not good, it may be possible that the magnetron is good. The problem could be with the Performance monitor unit itself. So before we change the magnetron, we can check the magnetron current. On JRC radars, click on the “Test” tab on the bottom right corner and turn the “Magnetron current” to on. Read the magnetron current reading. Magnetron current should be between 5 ~ 9.5. If actual magnetron current is on higher side of this range, the magnetron is OK. In this case we may want to call the service technician to check (or replace) the PM unit. Radars are eyes of the navigator. More so in these days when we rely more on radar for look out than on our eyes. But using the radar without proper settings would mean having a look out with half closed eyes. Setting up the radar in a way to have all the targets plotted perfectly is as important as using the radar itself. While the setting up procedure can change considerably with each make of the radar, it is important that we know how best to set up the radar. Setting up in a way to not to miss a single target on the screen, irrespective of how small it is. Each of us must try our hands on these setting and should know what settings work when. Happy to help Pawan. 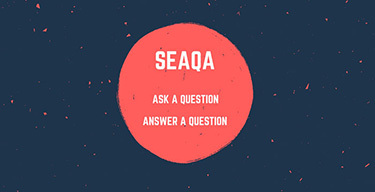 let me know if you have any question any time. sir why ror is based on heading of vessels & not on their actual track? samarjeet, Not entire ROR is based on that. Only the rules under section "When in sight of one another" are based on the heading of the vessel. 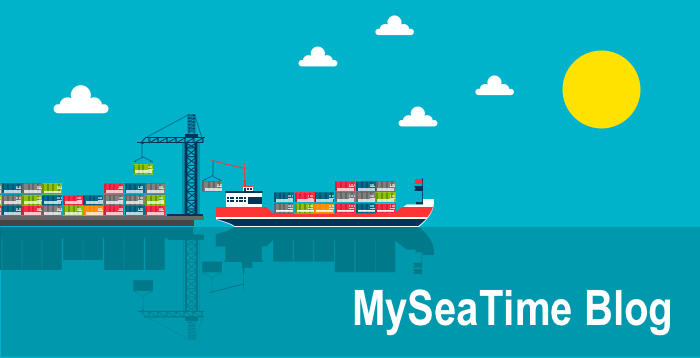 For rules under this section, we are supposed to take action when other vessel is in sight and looking at a vessel we can judge its heading and not course made good by it. This is explained in detail in Speed over water and speed over ground blog. Check that out. Let me know if you have any question anytime. I am not sure what Make of Radar you have ? In any case you need to look into the Radar manual for Performance Monitor test. 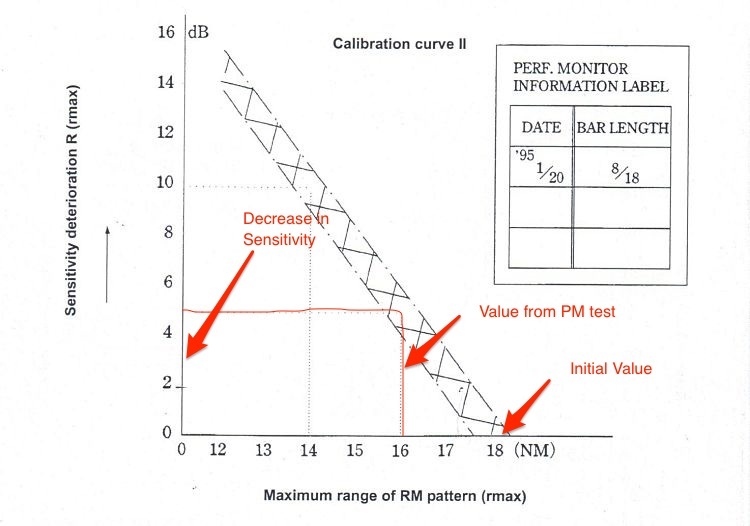 In case of JRC we need to look into the graph as shown in this blog and if the attenuation is more than 10db, magnetron need to be changed. So it means when we use radar for collision avoidance in a RV case, the speed need not be STW? I have to agree here that yes, it need not be STW in Restricted visibility. Would be glad to know your view point on this if you feel otherwise. Hi Anand, I feel the overtaking word used in rule 19 has different context that rule no 13. It has nothing to do with the definition of overtaking as per rule 13. That is what I feel. What's your opinion on this ? Hi Rajeev. You're right- overtaking is not defined under rule 19. However, the Rule allows an alteration to port for vessels forward of the beam that are being overtaken. 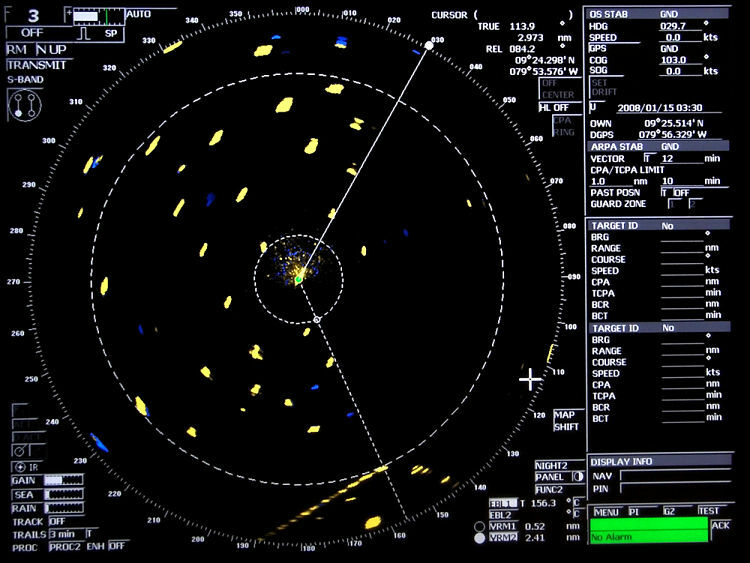 So before accepting that liberty, we need to ensure we're overtaking... and in restricted visibility, i can't think of of a more acceptable method than the radar plot... for which I require the water speed (for aspect accuracy). In the absence of a definition for overtaking in restricted visibility, I would go with the definition in Rule 13 (coming up from a direction more than 22.5 degrees abaft the beam).Thanks Rajeev. :-) Anand. Great work..thaks alot sir..i studied more info from ur blog..
Glad you are finding the information useful Daninda..
Glad you found it useful Nicolas.. Very informative wish you would do one on Furuno FR8252. Had it for a few years and have not been able to find anyone familiar with the unit. Even Furuno techs seem to be less familiar with this unit. Hi Skip, I will try to write on Furuno if I get my hands on a Furuno radar. Will right on that Ayush..
Good day sir. i highly appreciate your kind effort in these article which is seem to be perfect radar hand user guide, specially for those need straightforward answer and punch line for this matter. Best regards. Glad to hear that Aria..
hello sir...1 question for you.. What is another name for a calibration ring??? sir i have one doubt regarding cover pulse and main pulse. How do i observe them on oscilloscope. Please guide me on setting the oscilloscope. On our test bench we have waveform and signal generator as source. So, please help me out. My search for radar pm made me come here. The blog is very informative as well as educative. Keep up the good work. I didn't get a chance to do Radar PM while onboard because of the busy schedule and lack of time. So, my question is: is it possible to check radar performance by observing the concentric circles or arc that appear during PM Test? What should be the distance of circle with respect to ship?